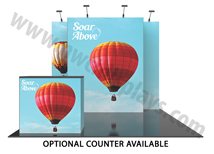 Vector Frame Geometric Kits are designed to draw attention. 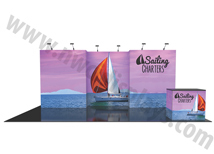 Multiple designs are available that use unique shapes and depth to create a backwall that looks polished and impressive. 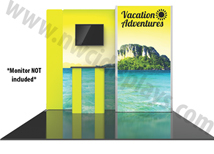 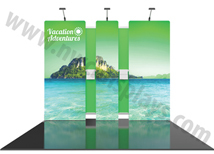 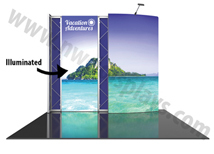 Some of our kits include a backlit panel to give the display a custom look that draws in exhibitors. 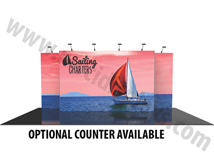 All kits have matching counters available to complete the booth space. 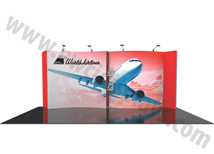 These booths work great with our interlocking comfort flex wood grain flooring to make the space more inviting. 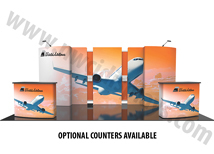 Each kit includes all the hardware, all the graphics, hard shipping cases, and lighting so nothing else is needed to create the complete backwall! 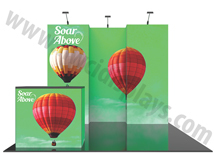 Lead time is only 6 business days and each kit is made to order in the USA!